Margriet Ruurs lives, writes books and produces this column on beautiful Salt Spring Island, BC. This month for a change, author Linda Bailey, offered to interview HER . Here is Margriet, coming out from behind her own book covers! Linda: I know that you’re an adventurous global traveler and that you often speak at far-flung international schools. How does your “traveler” side connect with your “writer” side? Margriet: I am fortunate to be invited to international schools for author visits. I love to travel and this gives me an opportunity to visit countries, meet teachers and children and explore places I might not have gone to otherwise—such as Mongolia or Israel. It’s become a kind of chicken-and-egg cycle: my travels lead to new books, and my books lead to more travel. In my latest book, Families Around the World I asked fourteen children and their families about an ordinary day in their lives. The book reflects what I have learned through my travels: everyone has similar hopes and dreams, regardless of where they live or what their faith is—peace, a place to live, an education. The next book, out in Spring 2015, will be School Days Around The World. It will show how different and yet how similar a day in school can be for children in different countries and cultures. 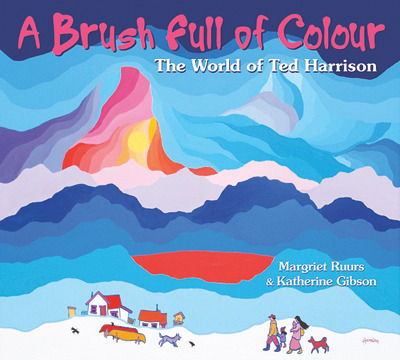 Linda: Your new biography of Yukon artist Ted Harrison will be a welcome treat to his legions of fans. How did this book come about? Margriet: My family and I lived in Whitehorse, Yukon for nine years. Ted and his wife Nicky lived around the corner. They were both the most generous, kind people—and immigrants, just like us. I first interviewed Ted for the Yukon News many years ago. We became friends, and my children sometimes painted with him at his house. I always thought Ted’s story was worthy of telling in a biography for children, especially since his art is so childfriendly and used by teachers in so many schools. The book shows how he evolved as a painter—from dreary coal mining country in England, via vibrant colours in Africa, India and other places where he served in the army, to the unique Yukon wilderness. I have always had many of his pieces on the wall and am honoured that he agreed to have me tell his story for Canadian children. Katherine Gibson added her expertise as biographer. Linda: In addition to your writing career, you also own and run a B&B. How do those interests work together? Linda: In addition to all of the above (you really are a marvel! ), you also edit an online magazine (KidsWWwrite) to publish the writing of children. How did that come about? 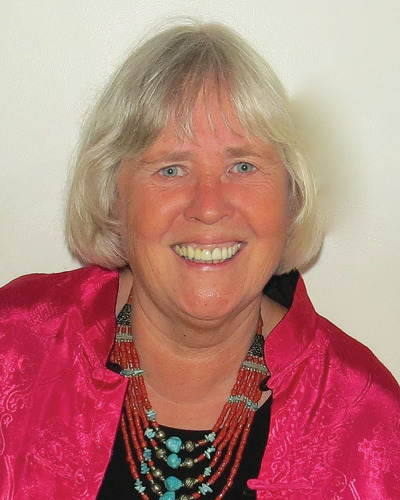 Margriet: I was doing my Master’s in education at Simon Fraser University and needed to do a thesis or project. I specialized in children’s writing and reading. Whenever I conducted writing workshops in schools, children wanted to know how and where they could publish that awesome poem or that great story they wrote. There aren’t many places for kids to get published, so I created KidsWWwrite. That was about fourteen years ago when the Internet was just starting to become more widely used. The site has snowballed into a very popular place for children to share their writing. I get around one hundred submissions each month from countries all over the world. It is touching to hear how much children appreciate feedback and the chance to share their writing. Linda: I understand that you recently received an honour for your work with KidsWWwrite. Congratulations! Please tell us about it. Margriet: KidsWWwrite is hosted by Okanagan University College. The webmaster works at OUC and generously helps to upload all submissions each month. I was honoured that OUC recognized the amount of work involved in editing one hundred poems and stories each month. It’s been a big commitment for the past fourteen years, but the reactions from children make it all worthwhile. Often they email me to say “No one has ever told me I can be a writer. I am so excited to see my story online!” I was touched that OUC bestowed me with an honourary fellowship for the work on this project. When they asked me to address the graduating class last June, I seized the opportunity to talk about the importance of school libraries to encourage children to be readers and writers. Once children discover the joy of reading, and of writing, they will succeed in anything. Linda: What does a typical day look like for Margriet Ruurs (besides busy!)? Margriet: Every day is different. Not much routine here. In the summer I make breakfast for guests, weed and work in the garden. In winter, I’m often on the road to do school visits. I like to write late at night when there are fewer interruptions. But the best thing in any day is hanging out with my 2- and 4-year-old grandsons. They are growing up on books and, more and more, are inspirations for my own stories. I am very fortunate that they live on the same property we do. They come and borrow books as if I am a public library. And they’re always ready to curl up with a good story. It’s exciting to read them my own books to see how they react. Linda: You write in a range of genres, and many of your books have become series. What’s your favourite kind of writing? Margriet: I just read that only the body grows old, but the soul doesn’t age. I think my soul is maybe nine years old and inquisitive. Ideas pop into my head all the time. Sometimes a poem marches in, unannounced. Or questions lead me to research answers that beg to be written down. So I don’t really have a favourite genre—I love all writing. At the same time, I think that the conciseness of free verse writing is one of my favourite ways to tell a story. But I haven’t published any free verse yet… I find more and more now that, when I read books, I have no patience for adult books that have so much redundant text. I like the immediacy of YA novels and read any genre I can get my hands on. Linda: Any thoughts about future projects and directions? Margriet: I’m working on several really cool ideas. Mostly books of nonfiction because that seems to be what publishers want right now. These stories will take me on more travels to Asia and Africa, so I’m excited. And I just translated my first picture book from Dutch to English for a publisher. I’d love to do more of that too. Linda: Congratulations, Margriet. Happy travels, and we look forward to many more books!